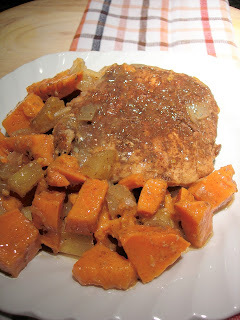 I'm always looking for new ways to use sweet potatoes. I mean, candied yams smothered in toasted marshmallows definitely has it's place in the Thanksgiving line-up. However, I'm always looking for new ways to use sweet potatoes. I've been toying around with ideas for this recipe for a while, debating which spices to use, or the ratio of apples to sweet potatoes. I finally got around to making it today, and let me tell you - it was good! I can't believe I waited as long as I did to actually make this. Preheat oven to 375. In a bowl, combine sugar and spices for the rub. Be sure to blend it well, mashing out any lumps. Cut up the sweet potatoes, apple, and onion and set aside in separate bowls. Use about 1/3 of the onion to cover the bottom of a medium sized casserole dish. Rinse pork chops and pat dry. Coat both sides generously with rub. Quickly sear both sides in a hot pan and place chops in casserole dish over onions. Layer sweet potatoes, apples and onions on top until casserole dish is full. As you go, sprinkle about 1 Tbsp of the rub over the sweet potatoes and apples. Pour the broth over the top, cover with foil, and bake for about an hour, until meat is cooked and sweet potatoes are soft. *Note* - you can also make this in a crock pot. Sear the meat and layer everything the same way in the crock pot. Cook on low all day.